We are always trying to tell people (anybody who will listen, actually!) about #locksmithscams. Locksmith scams are plaguing the industry. All legitimate locksmiths must try to do their part to rid the world of unscrupulous companies that practice ripoff tactics. However, the public must be involved. The public can help legitimate businesses by spreading the word (through friends and social media) about the local ripoff companies. 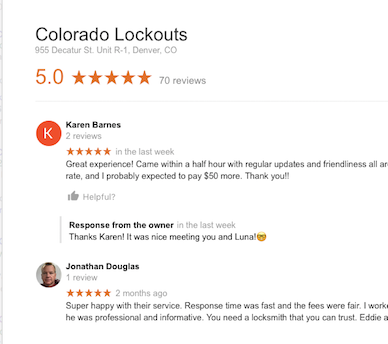 They can also help by posting positive reviews about locksmith companies (all other businesses too) on sites like Yelp, Google, and others. We are very proud to have received our 70th, 5 star review on Google. 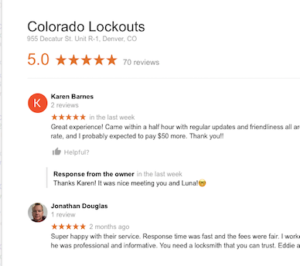 Thanks to all our customers, but especially to those who took the time to reviews us. We thank you and the Colorado community thanks you!